Eco-Friendly Timber (Malaysian Oak) Rubber wood also known as Malaysian Oak is classified as a light hardwood its pulp is a pale creamy white color when first cut. After it is Kiln driedto extract moisture, a process that increases its strength & make it easierto work with, it takes on a light brown color. 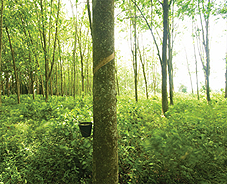 In Malaysia, millions of hectares of land are planted with rubber trees(Hevea brasiliensis) and certified plantations seed new trees upon loggingthe old trees. It is a process cycle that maintains the ecological balanceof mother earth. Chosen for having some of the same basic characteristics as teakwood withoutthe expenses, KGF Resource prefer Malaysian Oak as our core productionmaterial. All KGF products are designed with emergence of eco-friendly Malaysian Oakwith bent wood molding technology. The designs emphasis on the beauty ofcurved woods which effectively provide strong structural support and at thesame time, functionally give ergonomic comfort to users. The simple andclean bending curves evoke a contemporary sense of style to the designswhile the nature of using an Asian originated material further gives ourfurniture a distinctive character of their own. 1-Unfiltered UV rays discolour furniture and cause wood to warp. So, keep your furniture from excessive exposure to sunlight and heat. Never drag because dragging weakens the joints. Instead, lift it. Also, avoid pen impressions on your wooden furniture by having a pad underneath your sheet of paper when you write. Chemical detergents and cleaners damage wood finishing so steer clear of them. For daily care, use a damp cloth with water or mild water solution over the surface. Then, remember to wipe it off again with a dry cloth. 3-When it comes to fabric... vacuum or brush lightly with soft bristled brush to remove any accumulation of dust and dirt. Also, remember to flip your cushions or pillows regularly so both sides wear evenly.When it comes to leather... avoid soaps, detergents, sprays, oils and polishes that aren't specially made for leather care. A dry cloth and lukewarm water are usually enough to keep your leather's natural brightness and texture. Then let it air dry instead of using a fan or hair dryer. Also, prevent premature fading by placing your leather furniture away from direct sunlight. 5-On wood... a little bit of lemon juice can go a long way when rubbed into stains with steel wool. But, be sure to be gentle, as wood scars when pressure is applied. After removing the stain, you should also polish the area with furniture spray.On fabric... it's unbelievable what works - hairspray. Light stains can be removed by spraying the hairspray directly onto the stain and blotting till no ink can be lifted. If the stain requires more attention, pour the hairspray directly onto the affected area to saturate the ink, then blot until ink disappears.